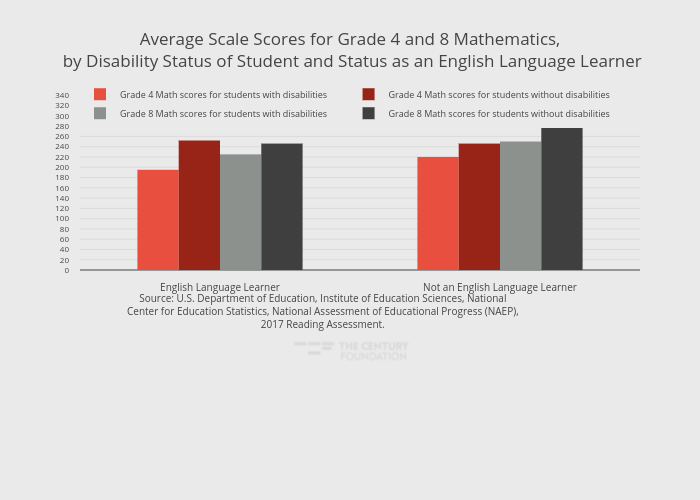 Thecenturyfoundation's interactive graph and data of "Average Scale Scores for Grade 4 and 8 Mathematics, by Disability Status of Student and Status as an English Language Learner" is a grouped bar chart, showing Grade 4 Math scores for students with disabilities , Grade 4 Math scores for students without disabilities , Grade 8 Math scores for students with disabilities , Grade 8 Math scores for students without disabilities ; with in the y-axis. The x-axis shows values from -0.5 to 1.5. The y-axis shows values from 0 to 350.2631578947368. This visualization has the following annotation: Source: U.S. Department of Education, Institute of Education Sciences, NationalCenter for Education Statistics, National Assessment of Educational Progress (NAEP),2017 Reading Assessment.